After years of hard work, finally your business started to pick up. You are selling more products then ever! You have lined up a good number of suppliers and buyers. Things have never been better than now. Except one thing! With rising sales your overhead and supply chain expenses are also sky-rocketing. Your profit margin is no longer the same as it used to be! You feel that you are in a limbo! How to increase productivity? How to cut costs without giving up sales? Sounds familiar to you? Well, your company is not alone! According to IDC, a research firm, while interviewed, overwhelming majority of the company executives claimed that their biggest concern is declining profit margins. Companies, in order to stay competitive, must find solutions to increase efficiency in business operations and control costs. Is there a solution to this ubiquitous problem? Remember Dorothy from the children classic “Wizard of the Oz”? She had to go through numerous obstacles in her quest to find a way to get back to Kansas, her home. Only to find out that the silver shoes that she was wearing from the very first day since the cyclone brought her to the Land of Oz could have taken her back home, all she had to do was to knock the heels together three times and command the shoes to carry her wherever she wished to go. Similar to this story, solutions to these corporate problems are widely available right under your nose, only you as a company executive have to overcome the fear of new technologies and adopt them to your own good. B2B exchanges or emarketplaces are capable of solving many key problems that corporations are facing today. Emarketplaces can provide immense opportunities to automate supply chain process, increase operational efficiency, reduce overhead costs and expand market at a minimal cost. Two primary factors of company productivity are Revenue Increase and Cost Cutting. Both are achievable if a company seriously decides to incorporate emarketplace features in all aspects of business operations. That means if as a company you want to reap all the benefits of emarketplaces, you have to commit yourself seriously. Once you find an emarketplace that suits your requirement, the first thing what you have to do is to register and become a member. Most emarketplaces have different membership packages. Although, to check out the emarketplace – whether it is viable for your business or not – you might start with the free membership package, but once you are satisfied with your selection, to use the emarketplace to your advantage you should choose the package with most features and functions. If you are a supplier, this is a very important step to take. Unless you have thousands of products to sell, this should not be a difficult task. All emarketplaces use either a form or wizard-based, not-so-complex and user-friendly product adding tool. Since e-catalogs that emarketplaces use are industry standard, once you aggregated you products, same information you will be able to use in other e-catalogs, emarketplaces and even in your own website. Apart from your own buyers other prospective customers from the emarketplace community are able to view your products in the e-catalog, which in turn will bring you new contacts and sales. You should create sales offer of your primary products that you carry most of the time and post them on the emarketplace. Many emarketplaces have options to sell products with different procedures. You can make offer to sell access inventories through dynamic market, also called auction, you can make hot offers with time limit, etc. This is an extra sales channel in the beginning, which might grow into your primary one! If you would like to use an emarketplace most effectively, you have to get your suppliers and buyers on board too. Supply chain management solution that usually comes with an emarketplace allows you to reduce operational costs significantly. • Encourage your buyers to send request for quote for a product through the inbuilt system of the emarketplace. • Make strict rules within your company to send all quotes exclusively through emarketplace. • Ask your buyers to send Purchase Orders to your company via emarketplace. • Bill all your clients using invoicing system of the emarketplace. • Manage shipping and handling though emarketplaces. • Convince your suppliers to use the same emarketplace so that even as a buyer you can get the benefits of a B2B exchange. Complete adoption of an emarketplace will help a company gain numerous benefits. The following figures taken from various research notes emphasize the importance of e-marketplace in today’s business world. Thanks to emarketplace, companies can reduce purchase order processing cost from US $75 to less than US $10. • By automating sales and customer support processes companies can lower overhead costs up to 25 – 30% easily. • Companies also can reduce more than five percent of their maintenance, repair and operation by incorporating e-business solutions, which are integral parts of any emarketplace. • Business process automation using B2B emarketplace helps companies decreasing of document errors from 20 percent to less than one percent. The famous inventor Thomas Edison once told, “Opportunity is missed by most people because it is dressed in overalls and looks like work.” Company executives are by no means afraid of hard work, but unfortunately many of them have colossal fear of high technology and because of this reluctant to explore new Internet-based technologies to their advantage. If you are one of them, be assured that knowledge required to adopt emarketplace to your business and manage it properly is easy to learn and implement. Although, IT spending has been staying flat for the last several years, corporate spending in e-business is gaining significant ground and at present surpasses 20 percent of overall IT budget. This means, more and more businesses are undertaking ecommerce initiatives, and as a result increasing sales, streamlining business processes and dramatically boosting productivity. Most experts agree that average business, which is slow in adopting e-business applications, risks loosing its competitive edge to their more progressive rivals. Emarketplaces provide with a great opportunity for small to medium size companies to test online business for a minimal risk. This is due to the factor that the e-business applications that come along with an emarketplace membership package are prohibitively expensive to develop in-house by most companies, and require large professional workforce to operate. As an example: product content development with required attributes, suitable for e-business, itself might feel like a daunting task for most offline companies. So, as a company, what should be your first step in starting e-business through emarketplaces? 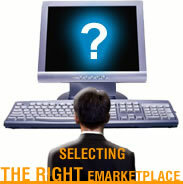 Naturally, out of hundreds of emarketplaces available today, you have to find one that matches all your requirements. In best case scenario, if yours is a large enough company, you should build your private emarketplace with all the necessary features specific to your business. The potential of having your own emarketplace is amazing! However, as I mentioned earlier, if you are not a very big company, you will probably be better off with a membership in an established emarketplace. If you are a manufacturer, wholesaler or a buyer of certain industry specific products or services, your best choice would be a vertical emarketplace that caters specially your industry. For example: if you buy or sell fish, you should look for an emarketplace that deals with this product only. Another thing that you should keep in mind is how geographically limited your business is. If you buy and sell fish within the locality of your state or region, if available, get an emarketplace that works in your region. Totally different story, if you carry large number of products from different industries; for you a horizontal marketplace that cater a range of industries is a better choice. If you are an international trader involved in import or export, you should select a global emarketplace, which has members from the countries you deal with. A good emarketplace amasses various features in order to facilitate smooth transactions of business deals. However, there are some key attributes that are absolutely necessary for any emarketplace to become successful; and as a prospective member you should look for these features and characteristics while choosing an emarketplace for yourself. While it might not look so important from the surface; to have accurate, well-defined and timely-updated product content is extremely crucial for any online business. Since you have to integrate your product catalog to the aggregated electronic catalog of the emarketplace, which could be a very complex task, you should make sure that the classification system that they have is widely used online; and if necessary you can use same product content with other emarketplaces or e-procurement applications. The best option, as I believe, is based on The Universal Standard Products and Services Classification (UNSPSC), which is a global coding system that classifies products and services. This categorization scheme covers the broadest collection of industries and commodities available today, and designed to facilitate e-commerce transactions by providing geography-independent common nomenclature system. Members of the emarketplace should be able to locate any product or service, whether in the auctions, marketplaces, or in the catalog with ease. Advanced search function should allow finding required items using precise query. Efficient supply chain management is the number one strategic priority for many businesses. In 2001, Cisco System alone had to write off US $2.5 billion in excess inventories due to poor management of its numerous outsourcing contractors. E-marketplaces can help streamlining your supply chain process if the required features are embedded in their system. Usually most emarketplaces incorporate a searchable directory of their members. The members get an added opportunity of creating new business relations and increasing sales thanks to this feature. In order to make product content adding and maintaining easier for sellers, the marketplace must have an uncomplicated tool. The tool could be a wizard-based combination of simple forms. To integrate larger catalogs speedily and efficiently the emarketplace should have XML based interface. The process of posting an offer for sale of a product or a service on the marketplace should be simple and easy but sophisticated enough to create dynamic offer, offer with time limit, variable pricing based on quantity, etc. Simplicity – An emarketplace should be easy to learn and use. Large Community – The quantity of members should be big enough, so that new participants can expand their business. Flexibility – Emarketplace functions should be flexible enough to modify or add with new features when necessary. Neutrality – The emarketplace should be an unbiased venue for both sellers and buyers. No member should have any privilege at the expense of others. Providing an open and transparent market for all the participants is an important constituent of the value proposition of an emarketplace. In general, thanks to the large member base, e-marketplaces charge a reasonable subscription fee if you would like to participate in it. Many emarketplaces also charge a nominal fee for each trade made using their facilities. Other costs involved, that you should consider, are internal workforce needed to handle business via emarketplace, catalog integration and maintaining, etc. In any case, the cost of doing business through emarketplaces is negligible for most businesses compare to the gains they make. If you just build a corporate website and don’t spend required time and money to promote, it won’t bring any business. Same goes for emarketplace! Mere participation in an emarketplace also will not produce any significant benefit if you don’t convince your existing buyers and suppliers to work with you through your chosen emarketplace.